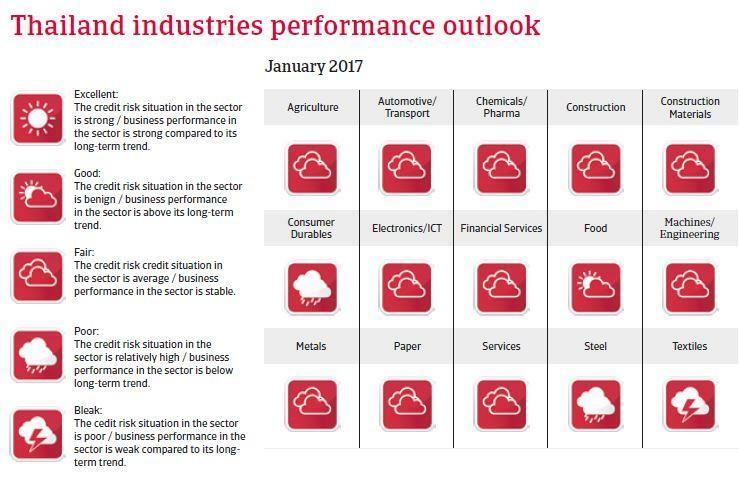 GDP is forecast to grow about 3% in 2017, but high household debt, inequality and low incomes will put downward pressure on consumption growth. Government type: Constitutional monarchy. Currently a military interim government is in power. The military junta, which is ruling the country since 2014, is determined to remain in power for the time being. A referendum on a new constitution, designed to curb the powers of populist politicians and to preserve the military’s major political influence, was held in August 2016 and approved by 61% of voters. General elections are expected to be held in late 2017 or early 2018. After King Bhumibol’s death, his son Maha Vajiralongkorn succeeded him on the throne in December 2016. 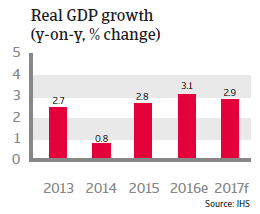 Thailand’s economy is expected to grow about 3% in 2016 and 2017, mainly due to increasing tourist arrivals (tourism accounts for 45% of services output) and public investment in infrastructure improvement, populist measures and long-standing subsidies. Extensive fiscal populism is expected to be pursued until the next elections in late 2017. 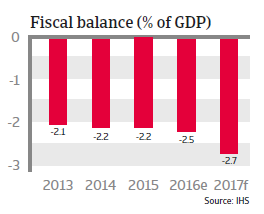 Due to the rising government spending and lower tax revenues both the fiscal deficit and government debt are increasing. That said, government finances remain sustainable, as government debt remains below 60% of GDP. Public debt composition is quite favourable (only 6% is denominated in foreign currency), and public debt held by non-residents amounts to just 16%. This insulates the government from external shocks. The country´s solid payment capacity and liquidity is underpinned by moderate foreign debt (in 2016: 34% of GDP and 51% of exports). 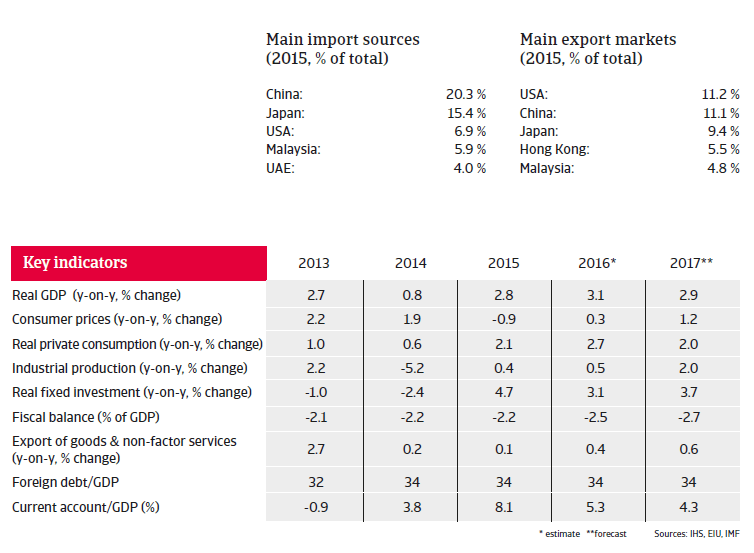 International reserves are forecast to amount to about 10 months of import cover in 2016 and 2017. The Thai banking sector is healthy, as banks are well capitalised, although profitability is shrinking. While lending is covered by deposits, non-performance loan ratios are low (2.4% in June 2016) and do not currently raise concerns. Yearly growth rates of around 3% are below the economy´s potential and lower than those of many of Thailand´s peers in Southeast Asia. 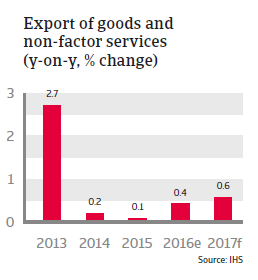 Higher growth is held back by less export demand from China and low commodity prices, which have eaten into the revenues of the agricultural sector. At the same time, household debt has increased to more than 80% of GDP in 2016. This, together with inequality and low incomes will put downward pressure on consumption growth in the coming years. Additionally, Thailand has to cope with an aging population, which will likely affect GDP growth rates. Reliance on tourism exposes Thailand to economic downturns in other economies (especially China, which accounts for a major share of tourist arrivals) and risks from security issues. The Thai baht is subject to a managed floating exchange rate regime, which reduces volatility risks. However, the expected decrease in the current account surplus (due to reduced exports and rising import costs to ensure supplies for infrastructure projects and government spending) and monetary tightening in the US will probably put downward pressure on the baht in 2017. While Thailand´s short-term economic outlook is positive, the long-term perspective is less so, due to decreasing international competition, high private debt levels and long-term political uncertainty. While stable for the time being, Thailand´s political future remains uncertain. The simmering conflict arising from the deep political, social and economic division between the old establishment (royal court, army, judiciary and urban upper class) in the south and the rural poor in the north has yet to be resolved, and is unlikely to disappear soon. High income inequality and poverty have increased social instability, which together with the current autocratic political trend increases the likelihood of renewed large scale protests - and the incentive for the military government to introduce costly populist transfer policies in order to appease the rural poor. Banks are less willing to provide loans to the steel sector, given the high default rate and the recent debt impairment from one big steel manufacturers. Nearly 90% of the survey respondents in Asia Pacific reported having experienced late payment of invoices from their B2B customers over the past year.